Sensing what is happening inside the injection moulding machine. The DRC 2020 HT visualization with the generous 19˝ upright format screen permits a simple and logical operation of the injection moulding machine. In conjunction with the perfect illustration of operating sequences, DESMA is once again defining the peak of technology with this system. Intuitive and highly convenient machine operation. 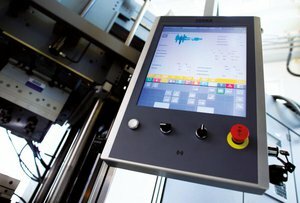 The innovative haptic touch screen does not only provide the operator with visual information, but also offers sensitive feedback. The screen supports logical operator guidance and illustrates even complex correlationsin an easy to understand manner. Even the input of machine cycles, in particular when parallel movements with several pumps are concerned, is possible in a quick and uncomplicated manner. The logical correlations of the input masks are established viagraphically animated assemblies and the operator will find it easy to get his bearings. The innovative control panel DRC 2020 HT can also be retro fitted on existing DESMA injection moulding machines with DRC 1210 and DRC 2010 visualization systems in a cost-effective manner.